Get access to ALL these classes for $25 a month. Or buy them individually. Priced as marked. I left the animation industry in 2010 to pursue personal projects and to teach. Teaching helped me to organize all of the art knowledge I had gained over the previous 11 years in my professional career and distil it down to core principles and techniques. I now pass this information on through an online art school called The Society of Visual Storytelling (SVS). The classes are an affordable supplement to art school. Mastering this skill is absolutely essential to becoming professional in illustration. I go through fundamentals to more advance approaches to perspective drawing. Learn how to draw awesome bad guys! In this class I share my techniques for designing evil characters of all kinds. Thinking about drawing comics? In this course I give an overview of the industry and shows you how to make a comic book from start to finish. Ka-pow! Ever feel like your images are a little off somehow? Well, light and shadow are often the culprit. In this class I show you the fundamentals of applying shadow and light in your work. One skill every ilustrator needs is the ability to draw the same character from different angles in different poses, over and over again. I'll show you the tricks to keeping your characters consistent. Drawing horses is scary! Put your fears to rest by mastering the art of drawing animals. In this video, I deconstruct principles of designing animals of all kinds. 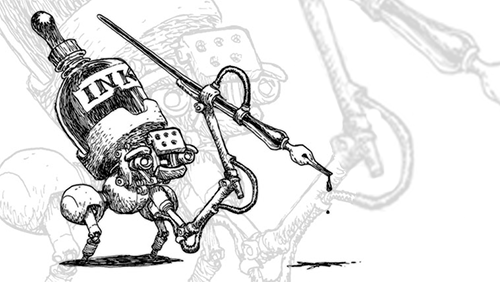 To draw believable machines, you must first learn the anatomy of machines. In this class I teach the principles of designing machinery that actually looks functional. Sometimes you just want to lay down some old school ink on some plain ol' paper. In this video, I demonstrate how to take your ink skills to the next level. Learn how to draw awesome good guys! This class will rescue you from weak character design and show you how your characters can save the day. Every awesome character needs an awesome world to live in! I'll show you how to design appealing and believable environments of all kinds. If you want to make it as an artist, you need to grow your audience! I'll show you how to harness the power of social media to build your following.